An unimpeachable classic work in political philosophy, intellectual and cultural history, and economics, The Road to Serfdom has inspired and infuriated politicians, scholars, and general readers for half a century. Finally, here is an edition of Road to Serfdom that does justice to its monumental status in the history of liberty. It contains a foreword by the editor of the Hayek Collected Works, Bruce Caldwell. Caldwell has added helpful explanatory notes and citation corrections, among other improvements. For this reason, the publisher decided to call this "the definitive edition." It truly is. This spell-binding book is a classic in the history of liberal ideas. It was singularly responsible for launching an important debate on the relationship between political and economic freedom. It made the author a world-famous intellectual. It set a new standard for what it means to be a dissident intellectual. It warned of a new form of despotism enacted in the name of liberation. And though it appeared in 1944, it continues to have a remarkable impact. No one can consider himself well-schooled in modern political ideas without having absorbed its lessons. What F.A. Hayek saw, and what most all his contemporaries missed, was that every step away from the free market and toward government planning represented a compromise of human freedom generally and a step toward a form of dictatorship--and this is true in all times and places. He demonstrated this against every claim that government control was really only a means of increasing social well-being. Hayek said that government planning would make society less liveable, more brutal, more despotic. Socialism in all its forms is contrary to freedom. The beauty of this book is not only in its analytics but in its style, which is unrelenting and passionate. Even today, the book remains a source of controversy. Socialists who imagine themselves to be against dictatorship cannot abide his argument, and they never stop attempting to refute it. Misesians might find themselves disappointed that Hayek did not go far enough, and made too many compromises in the course of his argument. Even so, anyone who loves liberty cannot but feel a sense of gratitude that this book exists and remains an important part of the debate today. The Mises Institute was honored that Hayek served as a founding member of our board of advisers, and is very pleased to offer this book again to a world that desperately needs to hear its message. I found this book to good, but also a bit underwhelming considering how highly regarded it is among libertarians and conservatives. I would recommend that others read it, but only after they've read the more important works out there. Hayek holds nothing back in his critique of central planned economies. His prose is that of a passionate defender of liberty who sees no justification for central planning. Still very relevant today. This book was amazingly great. It is somewhat of a slow read, but once in it i couldn't put it down. The only thing I don't really I guess like in the book is his excessive love of democracy. I understand why he promotes it, because he is a liberal and he also constantly promotes a liberal state. The parts where he did promote those things i found myself going through slowly. So a definite read, but anarchists beware this is not a document against the state just state planning in the economy. A vital instrument of any totalitarian regime is the thought police. Hayek understood this very well and the logical consequences of that understanding has been clearly expressed in this book. That alone makes this book a worthy read. Hayek falls short of the Misesian ideal however, and this book shows it. Hayek's argument stems from the false premise that central planning fails due to impossibility in centralization of thought, not impossibility in centralization of resource distribution as was later realized. You can check out for the cartoon form of this book on YouTube. Each sentence that Hayek writes would be a paragraph or chapter in other’s books. It’s a power mix of poetry, history, facts, observations, and conclusions. My Father and I have had conversations about the items in his book for years previous to reading it, however, I believe that Dad has never formally read the book. 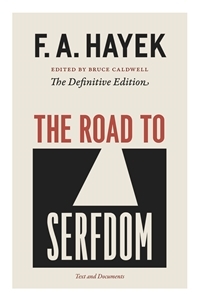 Nonetheless, Dads and Hayek’s agreement is a powerful endorsement for reading the “Road to Serfdom”. Caldlwell does a good job of footnotes and explanations for the more nescience readers like myself, nonetheless found myself using Internet search to look up terms, words, and historical references. I love aphorisms and Caldwell’s introduction that they might have not been in the original reading if not due to the absolute defiant response of Hayek made these snippets all the more enjoyable. It’s a short book, enthralling and delectable like a good steak, I read it slowing, digesting each paragraph like juicy morsel. I find myself quoting passages regularly. In these times of single party rule (blurring of quote “right” and “left”) this book is an unapologetic conviction of collectivism, government coercion for good, or socialist policies that current US leaders seem to be hell-bent on continued pursuit. “Road to Serfdom” is a truly provocative and crucial reading assignment, given the current historical parallels to the time that Hayek wrote this book. If you are looking to acquaint yourself with F.A. Hayek's perspective on economic theorym, this is the best source.